The feast of Corpus Christi (body and blood of Christ) is celebrated on the first Thursday of June as a special veneration of symbolic body and blood of Christ in communion wafers and wine. The indigenous were intrigued not only by the notion of a single god (as compared to their many) but that the Catholic god was so loving he offered you his body and blood for consumption instead of requiring animal, or human, sacrifices. An important fiesta in the 1800s Corpus Christi was a procession for the Spanish joining the clergy of the Parroquia, Oratorio and San Francisco under a single canopy of lace and velvet lined with 12 candles. They would visit the homes of the leading Spanish families (Lambarri, Sauto, de la Canal and Allende) to view their home altars, say mass and enjoy a meal. 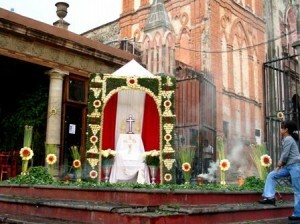 The streets of Correo, San Francisco, Reloj, Mesones and Hidalgo were lined with candles and until 1857, this area was identified as the Candle of Corpus Christi. Groups associated with the three churches found here would join the parade in their best clothing while clutching candles to view the home altars featuring silver candelabras, silk curtains, flowers and incense. While visiting the homes children received small bags of brightly colored candy from the homeowner. Over the centuries the traditions have changed but the manner of celebrating the day is still distinct. You can still view magnificently decorated altars with the Eucharistic and bible scenes while the children enjoy sweets.